1/5th Scale Off-Road: Rocky Roads Ahead? 1/5th scale off-road looks to be one of the up-and-coming things in R/C right now. HPI has been on the scene for a while with their 5b and 5sc platforms, and Losi will be getting their 5ive on the shelves soon. I have also seen a few concepts and knock-off type vehicles out there as well. I love 5th scale. The sheer massiveness of them makes me grin ear-to-ear. If you are into realism, I don’t think it gets much more real than watching a 5sc go around a track. It drifts corners and jumps just like it’s full-size brethren. They run on gas, are very durable and pricing is a bit expensive but comparable to a race-ready 8th scale car. 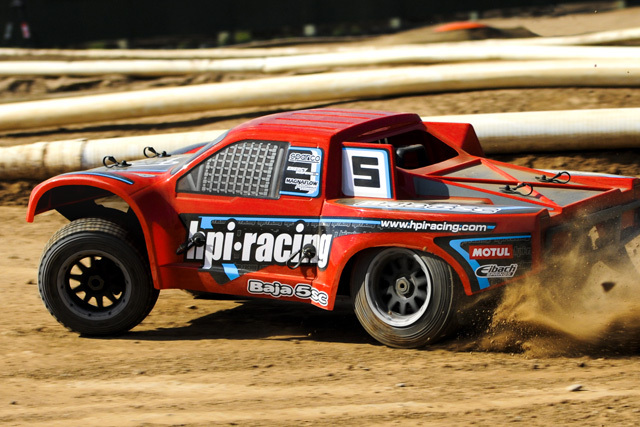 The local 1/5th-scale racing scene in Southern California is still in its infancy but is definitely growing. It is a lot of the basher crowd that has decided to try their hands in racing. Since there aren’t many large-scale cars out there yet, not many people have a big advantage when it comes to chassis and engines. It makes racing on a level playing field much more possible. I’ve been racing a lot of 1/8th scale nitro the last couple years and have seen a few people get hit. It makes me cringe every time. Luckily there haven’t been much more than some bruises and a few stitches needed. It got me thinking about 5th scale. These things aren’t as nimble and fast as an 1/8th scale buggy, but they are weighing up close to 30lbs! I can only imagine the carnage that is possible. Most tracks take safety into consideration when they are designing layouts and marshal spots, as they should. I definitely think this will be taken to a new level with 1/5th scale racing. Do you think safety is going to play a big factor or hinder the future of 1/5th scale racing? I’m sure we all have had R/C cars banned from certain parks by us due to fire and or safety concerns. Do you think 1/5th scale will make it even harder to drive in these areas if they aren’t closed already? I think it’s inevitable that the red tape and cotton wool brigade will get wind of the potential dangers of large scale racing and step in as a result, especially if it results in someone attempting to claim compensation for injury against an organiser. However if tracks and their owners employ a bit of common sense and work out safe spectator distance (just as they do with real tracks), sufficient protection such as barriers and catch nets, and insist their marshals don adequate protective gear, then it won’t have to be imposed by an external source. My main point being, a little proactive work now will save on any controversy in the future. It will however, likely incur costs to the organisers to make their track safe for everyone to enjoy and space may be at a premium, which I feel will be the main resistance against improving things. Marshall position is very important. At Bajafest the marshalls are on the very outside of the track and out of dangers way. All cars are also required to have a bright colored zip tie on the spark plug wire. In case of a stuck throttle the marshall can shut the car down. Another point is during the drivers meeting every racer needs to understand not to rev the engine and hold the brake as the marshall approaches your vehicle to right it. I have been racing 1/5th scale off-road for many years, and have never seen anyone get hit. I think 1/5th scale racers are “more aware” since these would do a lot of damage. I am building a new track here in Texas, and I am taking safety into consideration. This is a 1/5th scale track and only 1/5th scale, so it will be safe for 1/5th scale. My point is, when 1/5th scales are raced on tracks that are built for 1/8th scale, then they “can” become very dangerous. 1/5 scale racing has not really evolved down here in my part of the world but a few people have them as bashers and until recently have been enjoying running them at local BMX tracks. Unfortunately lately the powers to be have put a stop to this and consequently leaving little or no place to run these large scale trucks. The only parties winning are the online auction sites that now have these vehicles for sale. I can only hope there is change in the near future that will satisfy almost all.